This entry was posted in Uncategorized and tagged culture, food, health, Snacks, Thailand, Vendors by christao408. Bookmark the permalink. I love reading your blogs about Thailand! what you say about the difference between street venders and 7-11 type places in India (for Americans like myself anyway) is the total reverse because the street food in India can kill us or make us wish we were dead anyway. Same is not true of the Indian restraurants, which are mostly awesome, but never eat at the Mumbai airport even if you are starving to the point of absurdity! Maybe it’s mental or what you just said, but I always thought street vendor foods taste a lot better than the same food from some other place. The street vendors are what I miss the most about being in Asia. I think the only times I don’t eat street vendor food there are the times when I wanted to specifically try certain Western fast food places just to see what their versions are like.We’ve been having Chinese New Year festivals here for the last two weekends, and so the street vendors have been opening up in the plaza for us. It’s wonderful, having them. But I wish they were permanent; and I wish they were just downstairs from me so I could go down to them at midnight. One of the things I enjoyed the most when I was in Hong Kong – that was not available here – were the street vendors. Any time I was hungry or felt like having a snack I knew that I could just walk a few blocks and I could get myself something to eat, even if it were 2 or 3 a.m. I don’t make that a habit, of course, but I thought it was nice. It was much better than going to 7 eleven which was just across the street. I’ve heard lately that San Francisco is leaning more toward the street vendor route but with tepid results due to the stringent regulations and loooooong wait times securing a permit. Here’s hoping that we see more of this (along with decent quality) in the States! The growing waist line among children in India (especially in the cities) is a major concern too! Thanks to McD, KFC and sorts. I’m looking forward to hearing more about the street vendors. I’ve heard wonderful things about Thai street food! Yet people aren’t fat in Thai, even if the food is high in fat? The 7-11 near my place was always packed with kids. It was strategically positioned across the street from the main school entrance. @And_I_love – Will keep that in mind! =D@CurryPuffy – Chicken here just tastes better. 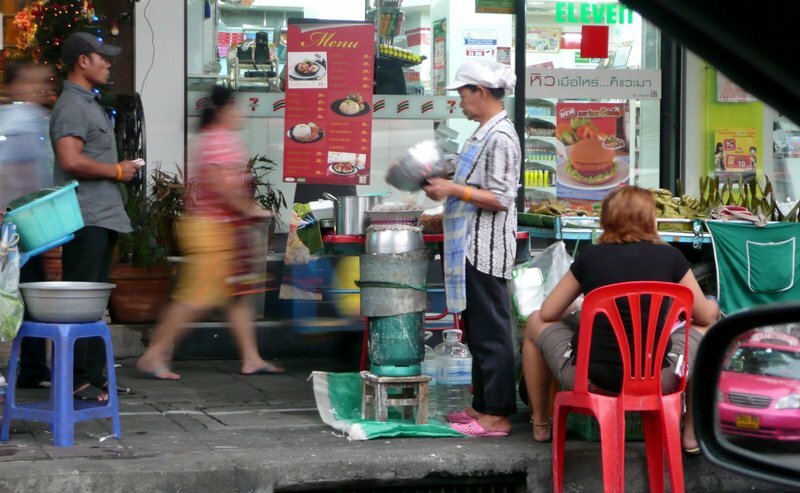 When I lived in Malaysia, I loved (and still love) buying my snacks from the street vendors! The fresh cut fruits, the yummy freshly squeezed sugar cane drink, or the fresh soya drink (and dessert), just to name a few. It is a pity that more and more kids (and some adults) today prefer the industrially packed, high-fructose snacks to the healthy ones. @bejewel07 – You have to think that not only obesity but all sorts of other ailments are caused by this shift from natural snacks to packaged and processed ones.